- Publisher The Easter story is one, which should be told throughout the whole year. Starting with Jesus' entry to Jerusalem, the sharing of the Lord's supper and the betrayal in the garden of Gethsemane, the story vividly portrays the pain of Jesus' death and the joy in His resurrection.You can read about this story in the Bible in Matthew, Mark, Luke and John. - Publisher Mary couldn't wait to tell people the good news she had seen Jesus He had risen from the dead, just as he said. You can read about this story in the Bible in Matthew, Mark, Luke and John. 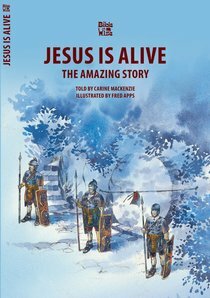 About "Jesus, the Amazing Story (Bible Wise Series)"
The Easter story is one, which should be told throughout the whole year. Starting with Jesus' entry to Jerusalem, the sharing of the Lord's supper and the betrayal in the garden of Gethsemane, the story vividly portrays the pain of Jesus' death and the joy in His resurrection.You can read about this story in the Bible in Matthew, Mark, Luke and John. Mary couldn't wait to tell people the good news she had seen Jesus He had risen from the dead, just as he said. You can read about this story in the Bible in Matthew, Mark, Luke and John.